Artificial Embryo Grown, a First: A Solution to the Stem Cell Debate? A Cambridge University research team lead by Dr. Magdalena Zernicka-Goetz has successfully grown the first functioning artificial embryo in history. Pioneering a hitherto unattempted approach, the experiment managed to grow a “mouse-like embryo” without using a sperm or an egg. Instead, they joined two different types of stem cells – another first in creating animal life from its basic foundation. Zernicka-Goetz’s historic success is a long awaited scientific accomplishment. Yet it’s greatest implications come in helping clarify long standing mysteries of early pregnancy. Zernicka-Goetz’s experiment sought to create a “mouse-like embryo” without ever using a sperm or an egg, the two gamete cells required for sexual reproduction of offspring. The research team utilized two different sets of genetically modified stem cells: Embryonic Stem Cells (ESC) and extra-embryonic Trophoblast Stem Cells (TSC). Both types of stem cell are required for proper embryogenesis in natural gestation. The two population were then introduced to gel-based scaffold that would allow the cells to grow in three dimensions. After introducing the cells to the gel scaffold, the scientists observed the natural organization and formation of embryonic structures that took hold of the cells’ development without any external interventions. During a period of week – roughly one-third of the typical laboratory mouse gestation period – the embryonic cells were observed developing and organizing identical to a natural mouse embryo. 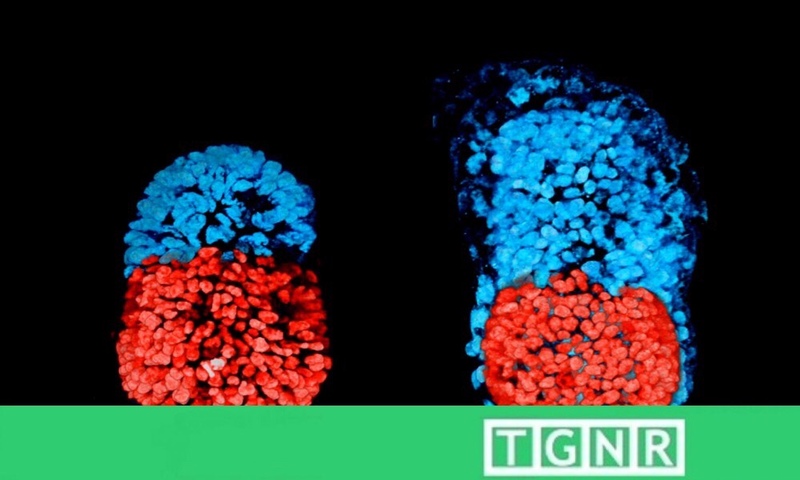 Zernicka-Goetz believes they have viewed for the first time the natural “communication” between these two separate stem cells in generating life under these conditions. The emergence of clearly defined cell groups called germ layers were recorded after the first four days. One group, called the mesoderm, would eventually develop into the heart, kidneys, bones, and muscles. After a full week, the embryo further differentiated into its two main sections: the cells that would give rise to the placenta migrated from the cells of embryonic mouse. The trial ended after reaching the week-plus mark, as designed. The experiment specifically did not include the necessary primitive Endoderm Stem Cells which form the yolk sac – a densely layered membrane, attached to the embryo providing nutrients and blood cells until the placenta assumes this role. As such, the researchers doubt the experimental embryo would have continued to grow properly. What are the implications for the Stem Cell debate? The intent of the experiment was not to create a fully grown embryo and generate life outside the womb. Zernicka-Goetz believes that it represents a fantastic opportunity to study the early gestation process. Specifically, Zernicka-Goetz hopes her research illuminates the period of implantation when most miscarriages occur. “We think that it will be possible to mimic a lot of the developmental events occurring before 14 days using human embryonic and extra-embryonic stem cells using a similar approach to our technique using mouse stem cells. Over the last 20 years, the controversy regarding the use of human embryos for stem cell research has gripped the global community. With ongoing ethical and scientific debates on this matter, the introduction of an artificial, non-human embry0 provides an avenue for further study without ever having to test on natural human embryos. Therefore, this accomplishment opens a new door that will allow researchers to further their study in this incredibly important aspect of human biology.